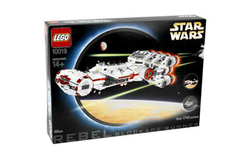 10019 Rebel Blockade Runner is an Ultimate Collector's Series set of Princess Leia's Corellian Corvette, the Tantive IV. This set was retired in 2003. You have to build the set in three different parts, then clip them together using TECHNIC pins. The cockpit is not to scale with the rest of the ship. This is a description taken from LEGO.com. Please do not modify it. Escape from the Empire in the Rebel Blockade Runner! Slipping through an Imperial blockade is almost impossible — unless you're flying the Rebel Blockade Runner! With more than 1700 pieces, this Corellian corvette model is so detailed and realistic you'll be ready to launch your own covert mission against the Empire. Built to scale, the Rebel Blockade Runner measures 28" X 11" x 7" and features LEGO bricks in an all-new color — dark red. Add this amazing model to your classic Star Wars collection. Ages 14+. 1748 pieces. Facts about "10019 Rebel Blockade Runner"
Escape from the Empire in the Rebel Blockade Runner! Slipping through an Imperial blockade is almost impossible — unless you're flying the Rebel Blockade Runner! With more than 1700 pieces, this Corellian corvette model is so detailed and realistic you'll be ready to launch your own covert mission against the Empire. 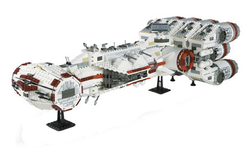 Built to scale, the Rebel Blockade Runner measures 28" X 11" x 7" and features LEGO bricks in an all-new color — dark red. Add this amazing model to your classic Star Wars collection. Ages 14+. 1748 pieces.